Full steam ahead! The exciting and colorful Emerald Express steam train is packed with detail, from the old-fashioned funnel to the driver’s cab and the bars at the front that push cows out of its way. Moo! When it’s time for a change, you can rebuild it into a fast rocket train or a carriage. Combine with additional Emerald Express sets to create an even longer train! Last known price is 42% above the initial Lego retail price! 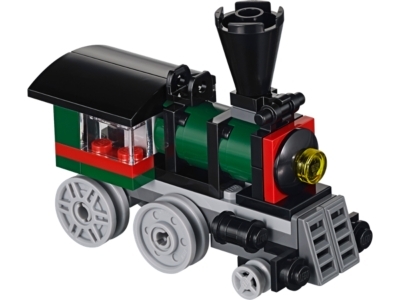 The Emerald Express (31015) Lego set is no longer directly available from the sites below. However, 3rd party partners of these sites might still have the set available. Alternate description Build the 3-in-1 LEGO® Creator Emerald Express with chunky wheels, funnel, light, cattle bars, driver’s cab and windows!